It’s impossible to fully tell the story of Angel’s Envy without also telling the story of Master Distiller Lincoln Henderson. 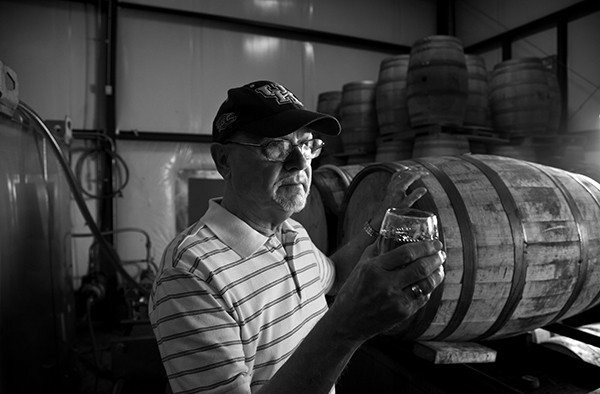 His final creation, Angel’s Envy represents the sum total of nearly a half-century of bourbon experience. Finally independent and free to explore in unique and unexpected directions, Angel’s Envy is unlike anything else he’d ever crafted. But what drove a man to pioneer such an unconventionally delicious bourbon? In the spirit of George C. Clark, Daniel Boone, and so many other pioneers before him, Lincoln moved around frequently until settling down in Kentucky. Before graduating from high school, he’d lived in Oklahoma, North Carolina, Wisconsin, Kansas and Alaska. He studied pre-med at University of Louisville with every expectation of practicing medicine. He also married his lovely wife in 1964, one year before graduation. But after earning his Bachelor of Science in chemistry, he realized that he had no real passion to continue with Medical school. I guess looking back it was better to be a famous distiller than a mediocre doctor. Aimless and armed with a chemistry degree, he took a job at Brown-Forman and was quickly promoted to Grain Chemist. Over the next few years, he moved up from Distillery Manager Trainee to Organoleptic Chemist. As a Distillery Manager Trainee, he spent one month essentially living at Brown-Forman for 24 hours a day, learning every aspect of production. During this time, he and his wife also celebrated the births of their son Wesley, and their daughter Stacey. By 1975, he was working as the Manager of Sensory Evaluation. This role allowed him to develop Early Times Kentucky Whiskey, Gentlemen Jack and Early Times Premium. In 1995 he was promoted to the Director of Whiskey Development, and the following year he famously developed Woodford Reserve. Following the releases of Forester 1870 and Jack Daniels Single Barrel, he was inducted into the Bourbon Hall of Fame in 2001, and in 2003, he earned Whisky Advocate’s Lifetime Achievement Award. After retiring from Brown-Forman in 2004, he served as the U.S. Spokesman for Suntory International until 2011. Throughout his career, he also enjoyed a close relationship with Japan’s Suntory Beverage Group, working with many of the country’s top distillers. He often spoke with great fondness of his time spent in Japan and the friends that he remained in contact with with. Beyond Japan, Lincoln travelled extensively around the world, collaborating with colleagues on a number of projects, most notably developing a universal language for the discussion and codification of sensory evaluation. While Lincoln created many spirits, Angel’s Envy was his masterpiece. When his son Wes approached him with the opportunity, Lincoln was drawn to the idea of a return to genuine small-batch, hand crafted bourbon. And being independent from the larger distilleries also meant that he could explore in creative directions that he’d always wanted to pursue, which is how Angel’s Envy got its award winning port finish. Over his career, he’d spoken in depth with countless bartenders and bourbon fans, and many had expressed interest the flavor possibilities finishing could bring to bourbon. Lincoln believed that a port finish would perfectly pair with our spirit, and after finishing and tasting the first batch, he was certain that he’d made the right choice. Traditionally, the 5% of spirit lost each year during barrel aging is called the “Angel’s Share.” After tasting his finished bourbon, Lincoln joked that maybe they’d finally gotten a better deal than the angels. And so Angel’s Envy was born. Lincoln always did have a peculiar sense of humor. He was proud of his final creation, and even during his last few months he kept working, restlessly tinkering to improve his spirit. After tasting his finished bourbon, Lincoln joked that maybe they’d finally gotten a better deal than the angels. And so Angel’s Envy was born. We’ve spoken at length about Lincoln’s professional achievements, and while he loved his work, he was happiest simply spending time with his wife, children and grandchildren. He was a loving and devoted husband, father and grandfather that treasured his family above his career and accomplishments. While he was often described professionally as a malcontent, personally he was a warm and gracious man. And though Lincoln Henderson is missed every day, we like to remember him every time we taste Angel’s Envy.